Editor’s note: This April 15 story has been updated with a new photo after the publication of a paper in the May 21 Nature by archaeologist Sonia Harmand of Stony Brook University and her colleagues, who describe their discovery of the oldest stone tools in the world. Harmand had previously presented the finding at a conference in April. SAN FRANCISCO--Archaeologists working in the Kenyan Rift Valley have discovered the oldest known stone tools in the world. Dated to around 3.3 million years ago, the implements are some 700,000 years older than stone tools from Ethiopia that previously held this distinction. They are so old, in fact, that they predate the earliest fossils representing our genus, Homo, by half a million years. As such they suggest that stone tool manufacture began not with Homo, but with a more primitive member of the human family. A happy accident led to the discovery of the ancient tools. 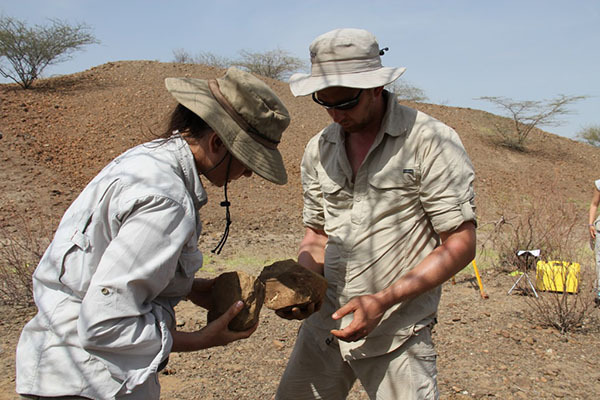 Sonia Harmand of Stony Brook University and her team had been en route to a known fossil site on the western shore of Lake Turkana one morning in July 2011 when the group took a wrong turn and ended up in a previously unexplored area. The researchers decided to survey it and by teatime they had found stone artifacts. They named the site Lomekwi 3, and went on to recover dozens of tools—including flakes, cores and anvils--from both the surface and below ground. Harmand described the findings April 14 in a talk given at the annual meeting of the Paleoanthropology Society in San Francisco. “The cores and flakes we recovered are clearly knapped and are not the result of accidental or natural rock fracture,” Harmand said. “The Lomekwi 3 knappers were able to deliver sufficient intentional force to detach repeatedly series of adjacent and superposed flakes and then to continue knapping by rotating the cores.” The team determined the age of the tools based on their stratigraphic position relative to two layers of volcanic ash and a magnetic reversal of known ages. The tools from Lomekwi 3 are quite large—larger than the stone tools from the site of Gona in Ethiopia that were previously the oldest on record and larger than the rocks that chimpanzees use to crack open nuts. According to Harmand, preliminary observations suggest that the Lomekwi toolmakers intentionally selected big, heavy blocks of very hard raw material from nearby sources even though smaller blocks were available. They used various knapping techniques to remove the sharp-edged flakes from the cores. Exactly what the Lomekwi knappers used their tools for is not yet clear. Animal bones recovered thus far at the site do not show any signs of human activity. But evidence from another site does suggest that hominins (the group that includes H. sapiens and its extinct relatives) were butchering animals back then. In 2010 scientists working at the site of Dikika in Ethiopia, where fossils belonging to Lucy’s species, Australopithecus afarensis, had previously turned up, announced that they had recovered 3.4 million-year-old animal bones bearing distinctive marks. They argued that hominins had made the marks in the course of slicing meat off the bones with stone tools. The claim sparked heated debate. Some skeptics countered that the alleged cut marks were instead the result of the bones having been trampled by passing animals; others suggested that they were bite marks from crocodiles. The discovery of the Lomekwi tools does not prove that hominins made the Dikika marks, but it shows that near contemporaries of the Dikika hominins made implements capable of leaving behind such marks. The identity of the Lomekwi knappers is unknown. If stone tool manufacture is the exclusive purview of Homo, then Homo must have evolved far earlier than the fossil record currently indicates. A more plausible scenario, Harmand said, is that Australopithecus or another hominin, Kenyanthropus (found nearby)—both of which are known to have been around 3.3 million years ago--made the Lomekwi tools. Whether Kenyanthropus is in fact a distinct hominin lineage or part of Australopithecus is a matter of debate, however. Up to this point, the earliest stone tools have been considered part of the so-called Oldowan toolmaking tradition. Louis Leakey coined the term to describe tools found at Olduvai Gorge in the 1930s. But Harmand says the newly discovered tools are different enough from the early Oldowan implements to warrant a new name: the Lomekwian.